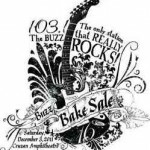 The 16th annual Buzz Bake Sale, sponsored by 103.1 The Buzz, was a day where South Florida Rock fans can really enjoy some live, loud, captivating music. Many Florida rock fans came out to the Cruzan Amphitheater on a warm South Florida December day to watch their favorite bands perform live in front of thousands of fans. These bands include Seether, Hinder, Everlast, Art of Dying, Middle Class Rut, and Falling in Reverse. Fans of these bands included everyone from teenagers to retirees. All day South Florida rock fans were singing (or shouting in some cases) while jumping with fists high in the air along with their favorite bands on stage. Other fans though, brought lawn chairs and towels and just lied down on the large field facing the stage while their favorite bands performed. Some highlights of the day for the fans other than seeing their favorite bands perform live, was meeting them! Many bands, once they performed, got to meet their fans, as well as give out autographs to those who wished. The whole day of performances cruised into the night, until Seether rocked the whole place off its feet, ending the venue with fans pleased. “They really rocked the show! It was an amazing performance!”-one Seether fan said after watching them close out the concert. Overall, Buzz Bake Sale was a day for South Florida Rock fans to listen, sing along, and have fun with their favorite musicians!